Congratulations to the Ottawa Art Gallery! I am so proud that the federal government contributed $6 million to this awesome project. Thank you for making Ottawa an even more exciting place for both residents and tourists. Added May 3, 2018 from Catherine McKenna. Congratulations Rosemount Library on 100 years! Libraries are so critical to communities. Thank you for providing a friendly space for everyone in the community to come together. Glowfair is one of the most anticipated events every year in Ottawa. Congratulations to the team, it's sure to be another successful festival. 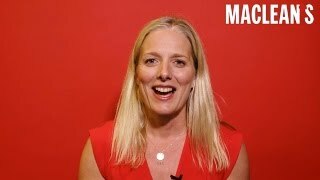 Added March 5, 2018 from Catherine McKenna. Budget 2018 has a lot to offer the people of Ottawa Centre. It builds on our government’s commitment to invest in people, communities, and the economy. I look forward to working with all levels of government on these exciting opportunities. Le budget de 2018 a beaucoup à offrir aux gens d'Ottawa-Centre. Il s'appuie sur l'engagement de notre gouvernement à investir dans les gens, les collectivités et l'économie. J'ai hâte de travailler avec tous les paliers de gouvernement sur ces opportunités intéressantes. The Art House Café is celebrating 1 year! Thank you for bringing local artists as well as everyone else in the community together and creating a positive impact with the arts. What a wonderful way to spend the afternoon. 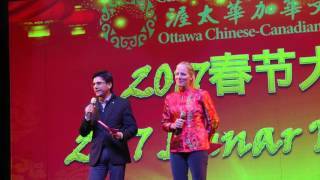 Thank you to everyone who joined myself and Yasir Naqvi​ at our New Year’s Levee. It was awesome to connect with folks in Ottawa Centre. Have you been able to keep your new year’s resolutions so far? Quelle belle façon de passer l’après-midi! Merci à tous ceux qui sont venus nous voir, Yasir Naqvi et moi, à la réception du Nouvel An. C’était merveilleux de parler avec les gens à Ottawa Centre. Avez-vous réussi à tenir vos résolutions du Nouvel An jusqu’à maintenant? This year marks the 4th annual Scottish Kilt Skate supported and hosted by the Scottish Society of Ottawa. The SJAM Winter Trail is Opening! The SJAM Winter Trail is a great way to stay active during the winter in Ottawa Centre. This weekend they are having their grand opening with lots of family activities. Come on out and celebrate! Ottawa Tutoring is a small business that now has over 20 employees from various educational backgrounds. The small business tax cut is really helping businesses like this to grow and expand. Great chatting with Elevate International - an organization that helps inspire, empower, and elevate young girls and women. They encourage girls and women to dream bigger and be leaders. This year during Firefighters' National Memorial Day we paid special tribute to those who lost their lives during the Halifax explosion. On December 6th 1617, two ships collided and as a result, 9 Halifax firefighters died along with many civilians. Awesome event in Ottawa Centre - Ride the River parade gives the chance for people in the community to come together and enjoy the beautiful river in Ottawa. Loved visiting Children's Village in Ottawa Centre. Their summer camp at gives children from low income families the chance to explore different areas and experience Ottawa. Nu Crocery is Ottawa’s zero waste grocery shop. This is an excellent example that environment and economy go together. The 13 Museli is a social enterprise that teaches teenagers between the age 14 -20 how to run business and give back to the community at the same time. Added May 11, 2017 from Catherine McKenna. I’ve just launched a new social media campaign all about being proud to call Ottawa home and sharing ideas on what we can do to make our city an even better place to live. To get the ball rolling, here are some of the people I’ve met in the past few months who are perfect examples of how to #OwnOurOttawa. Je viens tout juste de lancer une nouvelle campagne sur les médias sociaux : elle vise à célébrer la fierté de vivre à Ottawa et à échanger des idées sur les façons de rendre la ville encore plus agréable. Pour le reste de l’année, j’utiliserai les médias sociaux pour mettre en vedette des entreprises, des personnes et des histoires passionnantes que j’ai découvertes au quotidien, dans le cadre de mes fonctions de députée. Je vous encourage à faire de même. De nombreuses activités captivantes se passent dans notre ville et vous devriez les faire connaître. Alors, dites moi, que faites-vous pour suivre la vague #FêterNotreOttawa ? I've just launched a new social media campaign all about being proud to call Ottawa home and sharing ideas on what we can do to make our city an even better place to live. For the rest of the year I will be using social media to highlight cool businesses, people, and stories I come across in my daily life as a Member of Parliament and I encourage you to do the same. There are lots of incredible things happening in our city and we should be sharing them with each other. So tell me, what do you do to #OwnOurOttawa? En cette Semaine nationale de l’action bénévole, je tiens à remercier les incroyables bénévoles de notre collectivité qui travaillent fort toute l'année pour faire une différence, ici dans Ottawa-Centre. Today and every day, let's remind indigenous youth they matter, they are loved, and they are important. Thank you to the Assembly of First Nations and every other organization working to find solutions for this national crisis of First Nations youth suicide. If you or someone you know is struggling, please reach out to the First Nations and Inuit Hope for Wellness line at 1-855-242-3310. Added February 1, 2017 from Catherine McKenna. Added January 5, 2017 from Catherine McKenna. There is an exciting job opportunity in our Ottawa Centre Community Office! We are looking for an outgoing, self-starter with a passion for our community to join the team as the Community Outreach and Engagement Assistant. Apply today! Il ya une opportunité d'emploi excitant dans notre bureau communautaire d'Ottawa-Centre! Nous cherchons quelqu'un d'entreprenant, avec de l'entregent et une passion pour notre communauté joigne à l'équipe en tant qu’adjoint à l’engagement communautaire et à la sensibilisation. Postulez aujourd'hui! Added January 3, 2017 from Catherine McKenna. 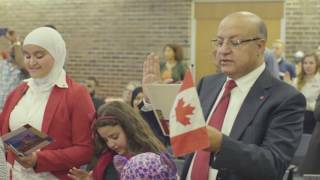 The YMCA YWCA of the National Capital Region was pleased to host a Citizenship Ceremony in October of 2016. People from over 50 countries became Canadian Citizens and our special guests, Olympian Sekou Kaba and the Honourable Catherine McKenna made it very special for everyone. Bonnes fêtes de ma famille à la vôtre! Added December 19, 2016 from Catherine McKenna. Pendant la saison des fêtes, profitez de tout ce que la région de la capitale nationale a à offrir: patinage sur votre patinoire locale et ski ou raquette dans le Parc de la Gatineau (vous pourriez même rencontrer William Amos sur les pistes!) Bonnes fêtes de ma famille à la vôtre! This holiday season, take advantage of all that the National Capital Region has to offer: skating on your local rink and skiing or snowshoeing in Gatineau Park (you may even bump into Will Amos on the trail!) Happy holidays from my family to yours! Added December 12, 2016 from Catherine McKenna. Added November 15, 2016 from Catherine McKenna. Added September 13, 2016 from Catherine McKenna. Happy Pride Week Ottawa! Bonne semaine de la fierté Ottawa! Added August 19, 2016 from Catherine McKenna. Happy Canada Day Ottawa Centre! Added June 14, 2016 from Catherine McKenna. Added June 6, 2016 from Catherine McKenna. En ce mois sacré, je vous souhaite un Ramadan béni et paisible! Le Ramadan nous rappelle que nous devons être compatissants envers les moins fortunés et reconnaissant de la prospérité et des bénédictions dont nous jouissons. De ma famille à la vôtre, Ramadan Mubarak! From my family to yours Ramadan Mubarak! Added May 31, 2016 from Catherine McKenna. Added May 16, 2016 from Catherine McKenna. Video from Family Day Thank-you Breakfast at Dow Honda in Ottawa this morning, February 13, 2016. Here Catherine McKenna, Minister of Environment and Climate Change Canada, shows a Syrian refugee family a photo of her kids dressed up for halloween. Added May 13, 2016 from Catherine McKenna. Added May 11, 2016 from Catherine McKenna. Added April 24, 2016 from Catherine McKenna. Merry Christmas, Happy Hanukkah and all the best for the holiday season. Joyeux Noel, Hanukkah heureux et joyeux temps des Fetes! Welcome to Your Community Office! Bon Jour de la Terre à tous les Canadiens! © 2019 Catherine McKenna. All rights reserved.